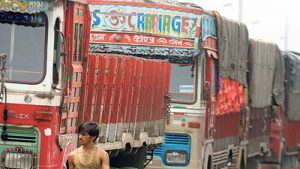 Truckers are demanding revision in fuel prices be made quarterly as daily fluctuation in petrol and diesel prices are forcing them to rework their freight cost every week. They are also seeking immediate inclusion of petrol and diesel under the goods and services tax. Before June 16 last year, fuel prices were set periodically. Diesel prices have gone up by over Rs 5 since June 1, 2017, which saw the last price revision before the new pricing system was adopted. On June 1, diesel price for one litre was Rs 60.68 and Rs 57.13 in Mumbai and Delhi, respectively. On Thursday, the price in Mumbai and Delhi was Rs 66.30 and Rs 62.25. “Daily fuel price hike does not augur well for the economy and the society at large. There is heightened concern over the deteriorating condition of the transporters due to demonetisation and goods and services tax coupled with perennial corruption and taxation that are impinging on our very survival,” said Bal Malkit Singh of All India Motor Transport Congress (AIMTC). Justifying their point, the association substantiated that in June 2007, when the crude oil price was $68.19 per barrel, diesel price in Delhi was Rs 30.76 per litre. A year later, in July 2008, crude oil prices touched an all-time high of $132.47 per barrel, while diesel price was Rs 34.86 per litre, almost half of today’s rate. Now, when crude oil barrel price is around $68.51 per barrel, diesel stands at Rs 62.25 per litre. Similar is the situation for petrol, which is touched a record high at Rs 79.44 per litre in Mumbai on Thursday. Another operator shared that there are over 85% of the truckers who are small operators and who work on a fixed price for every trip; they are the ones who cannot absorb this daily fluctuation in diesel prices. “It is surprising that India’s petrol and diesel price is costliest in South-East Asia, even though the neighbouring countries are also procuring the crude oil at the same rate,” read a media statement by AIMTC. “Now, it is time for central and state governments to cut taxes so that price rise is controlled and inflationary trend is restrained. The road transport sector protests the ongoing hike and requests for immediate inclusion of petrol and diesel under the GST umbrella in consonance with the agenda of ‘One Tax One Nation’ so that there is rationalisation of taxes and uniformity of rates across the country,” said Singh.